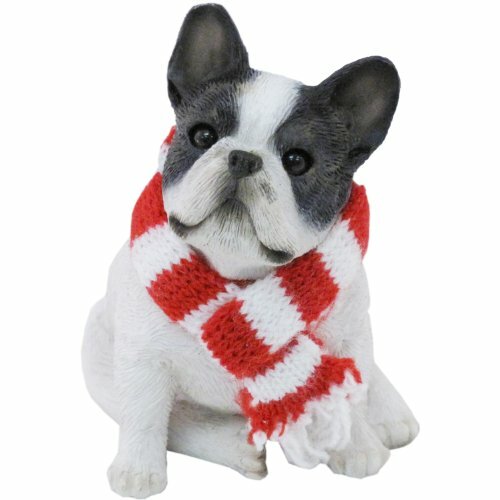 Save 1% on the Sandicast Brindle French Bulldog with Red and White Scarf Christmas Ornament by Sandicast at Animal Backgrounds. MPN: XSO02301. Hurry! Limited time offer. Offer valid only while supplies last. Pets are such an important part of our lives and our families. And, when christmas rolls around, they love the festivities just as much as we do. Pets are such an important part of our lives and our families. And, when christmas rolls around, they love the festivities just as much as we do. Sandicast's charming collection of christmas ornaments features over 40 different breeds of man's best friend enjoying the holiday spirit in a variety of ways: some sport bright red santa hats or are cozily wrapped in winter scarves, others are decked out in strings of lights or carrying christmas stockings. Several breeds are also available in multiple expressions and poses (sitting, standing, lying, sitting pretty or crouching), each one "decorated" for holidays in a different way. Sandicast christmas ornaments have a securely attached metallic cord loop for hanging and are packaged in a protective reusable box that's perfect for year-round storage. Don't feel like putting that special ornament away just because the holidays are over. Go ahead, enjoy it all year, we won't tell. Sandicast was founded in 1981 when artist sandra brue realized her dream of combining her artistic talent and her lifelong love of animals. Because of the superb quality of her work, collectors around the world now pursue the demand for sandicast animal sculptures. Queen elizabeth and president clinton are just a few of the many celebrities that have sandicast animals. Sandra has sculpted more than 400 animals; the sandicast collection includes everything from dogs and cats to exotic wildlife. Each piece is hand-cast and hand-painted and virtually comes to life when sparkling glass eyes are inserted. Sandicast invites you to discover their extensive collection of hand sculpted animals available on amazon. If you have any questions about this product by Sandicast, contact us by completing and submitting the form below. If you are looking for a specif part number, please include it with your message.